Recent release “The Modern Vampire: Torose” from Page Publishing author M.B. West is a work of science-fiction that depicts a story of vampires, war, survival and courage. M.B. 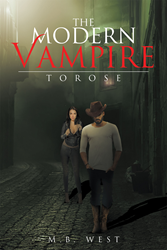 West, a devoted writer and author, has completed his new book “The Modern Vampire: Torose”: a gripping and potent tale of intrigue, mystery, super natural and manipulation with several unexpected twists in a unique science fiction plot. Published by New York City-based Page Publishing, M.B. West’s chilling work will keep the reader on the edge of their seat! Wes Michaels likes to be alone and left alone. Life is simple spent alone. The simplicity does not last when his knowledge of the world and human beings is turned upside-down. After killing an attacker on the street, he discovers that vampires are real. The vampire community dubs him torose—the one that got away. Like any trophy animal, he is protected by a few and hunted by others. His new status has made him an important piece in a political game of chess between vampires. Wes searches for answers, allies, artillery, and other things he didn’t need in the past and ends up with company he was not looking for. He did not want an overly seductive, vampire bodyguard who also works as an assassin. For Wes to survive in this new world, he will need to find a miracle and then some. Readers who wish to experience this enthralling work can purchase “The Modern Vampire: Torose” at bookstores everywhere, or online at the Apple iTunes store, Amazon, Google Play or Barnes and Noble. Page Publishing is a traditional New York-based full-service publishing house that handles all of the intricacies involved in publishing its authors’ books, including distribution in the world’s largest retail outlets and royalty generation. Page Publishing knows that authors need to be free to create - not bogged down with complicated business issues like eBook conversion, establishing wholesale accounts, insurance, shipping, taxes and the like. Its roster of authors can leave behind these tedious, complex and time consuming issues, and focus on their passion: writing and creating. Learn more at http://www.pagepublishing.com.